Beau brings to mind an old school fashionista, a gambler with a heart of gold, and a Southern gentleman, too. And now, today’s Baby Name of the Day also belongs to the youngest child of reality star Tori Spelling. Remember your high school French? This name means handsome, the masculine equivalent of Belle. In English, we’ve used the term to mean boyfriend since the 1700s. Today it seems quaint, even euphemistic, but you may still hear it in use. That doesn’t seem like promising inspiration for a child’s name, does it? In fact, this occurred almost exclusively as a nickname for years. You might think of Beau Brummell, England’s original dandy and arbiter of men’s fashion in the eighteenth century. He was born just plain George. Another eighteenth century fashionista, born Richard Nash, and known for his prominent role in making Bath the go-to scene for privileged types. PC Wren gave the nickname to Michael Geste for a 1924 adventure novel. Beau Geste translates something like “a fine gesture,” making the name a play on words. In the novel – and later movie adaptations, Geste joins the French Foreign Legion because it’s the honorable thing to do. Jimmy Walker served as New York City mayor during the Jazz Age. Scandal brought down his political career. He also answered to this nickname. In the 1940s, prizefighter Sidney Walker went by the name Beau Jack. Born Lloyd Bridges III, actor Beau Bridges took his nickname from a famous fictional bearer of the name. Despite long and prominent use as a nickname, some men really were born with the name. One reason? Family surnames like Beauregard. In Gone With the Wind, Ashley and Melanie’s son answered to the name, inspired by Confederate General Pierre Beauregard. The character also inspired the Bridges family to give Lloyd III his memorable nickname. In fact, the movie deserves credit for putting this name into use. Up until the the bestselling 1936 novel and blockbuster 1939 movie, it barely registered in the US Social Security data. By the 1940s, it appears in sparing, but steady, use. It lends the name a certain Southern gentleman vibe, but that doesn’t explain how it fully transitioned from nickname to established given name. Instead, Maverick, a television Western about a family of gamblers, caused the name to enter the mainstream at last. The show debuted in 1957. Brothers Bret and Bart starred in the early seasons. In 1960, Roger Moore joined the series as cousin Beau, and eventually a third brother, Brent, was introduced. Moore’s character bumped the name’s use up to a few dozen boys a year. It also transformed the name from French and foppish to at home on the range. By 1967, the name entered the US Top 1000. Actor Beau Bridges boosted the name. Then along came another small screen character: Days of Our Lives’ Bo Brady. Like many a soap opera character, Brady has been a little bit of everything, from motorcycle-riding bad boy to upstanding police commissioner. His full name is Beauregard Aurelius, but he’s always answered to just the two-letter Bo. The 1980s also gave us Vincent Edward Jackson, better known as Bo, one of the few professional athletes to succeed in both the NFL and major league baseball. Jackson teamed up with another famous Bo – musician and Rock and Roll Hall of Famer Diddley – to promote his signature shoe in a Nike campaign. Diddley, incidentally, was born Ellas. And, of course, there’s also Bo Derek, born Mary Cathleen Collins. There’s the tiniest uptick in the name’s use for girls in the same era, too. All of this explains why the name rose steadily through the 1980s, fueled by a combination of athletes like Jackson and actors like Bridges. It’s harder to pinpoint why Beau continues to soar today, reaching an all-time high of #187 last year. Partly we like our cowboy names, like Wyatt and Luke. And Bodhi, Bowen and similar-sounding names are all on the rise. But maybe this just comes down to sound. Beau feels fresh, upbeat, and unexpected without being invented, masculine without crossing into aggressive. Reality television star Tori Spelling has a knack for choosing the new It Names. Her children with husband Dean McDermott include Liam, Stella, Hattie, and Finn. Since the couple just welcomed son Beau Dean in May of 2017, that might be a sign that this name is headed even higher on the popularity charts. Do you like this name better spelled with an -eau or an -o? Would you choose a formal name, or do you like it best on its own? Originally published on March 31, 2010, this post was revised substantially and republished on December 7, 2017. This post answered a question I’ve had for a long time. In the movie, Annie (as in little orphan Annie), there’s a line in a song (You’re never fully dressed without a smile) that I’ve never understood. Now I see it must be Beau Brummel -y! Interestingly, here in the UK the girls aren’t far behind the boys with this one: http://names.darkgreener.com/#beau. In fact, there have been more girls called Beau than Belle for quite a few years now! I knew a girl named Beau and I think it’s just lovely. I even think that spelling is so pretty…it’s the beginning of Beautiful after all. Is Beau just too absurd for a girl? What about spelling it Bow? Like tying a bow…. Beau is masculine. If you’re looking for the feminine form of beautiful in French, it’s Belle. And Bow? No, just no. I am a Beau, actually, and there aren’t that many of us around. I think I’ve only met 2 others in the last 29 years! As a kid, I swore i was going to change my name the minute I turned 18, but I’ve grown into it since then. I like Beau. I know a Robert who goes by Bo, and I think it works. It’s not that much of a stretch. I actually know someone who has sons named Pierce and Beau. While I might not pick either name for my son, I respect her choices and find them refreshing. My cousin’s son is Beau – he’s now in his early 20s. I like it, but not enough to use it myself. There’s a rather famous Bo in the White House… Bo Obama. Last week at library storytime, there was a little boy (maybe 2 years old) and his name tag said “Beau”. I was all “Ooooh, not seen that one before!” in my head. The librarian didn’t know how to pronounce the name. It’s not really my style, but it was kind of fun to spot it on another child. It does sound rather soap-opera to me, having watched ‘Days of our Lives’ for awhile. Seriously?! The LIBRARIAN didn’t know how to pronounce it? Oh my. It’s not that obscure a word in English for goodness sake! Hahaha! Yeah, it was a bad week for storytime! The regular storytime lady wasn’t there & there was a fill-in librarian, who didn’t know some of the words to the rhymes. So maybe she was just having a bad day. 😛 She didn’t know how to pronounce Joaquin either, but that’s one you have to be familiar with. I know both a Bo and a Beau; the latter is actually IV, but has always been called Beau. 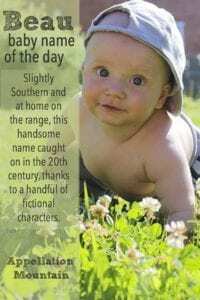 This is one of my favorite old-fashioned Southern nicknames, especially for a son who’s Jr., III or IV. I have a sister who answers to Bo, so Beau pops up on our lists. Except Aly misunderstood Bo as “Boat,” so he now has Aunt Boat and Aunt Bird. As a preteen I read an abridged version of Beau Geste. I found it a fascinating read, although not in my usual style. However, to this day when I hear the name Beau, I think of Beau Geste. I do hope to sometime read the complete novel, but I hope that for so many books that I’m not sure it will ever happen! The novel’s titular character lends the name a somewhat daring and dashing charm to my mind, but I think of it as more of a nickname than a given name. Don’t forget Bo & Luke Duke – it’s the first Bo I think of. Beau isn’t for me. As a nn I prefer Bo as a spelling. HOW could I forget Bo Duke?! Do you think Beauregard is too over-the-top? What are your thoughts on Beaux? Would people make a negative connotation to the name Beauregard (Confederate, etc.)? Thanks! I don’t think Beauregard is too much. It’s a big name, and it might be challenging with a longer or double surname. But I imagine he’d go by Beau, right? That makes it much more wearable. Does it feel Confederate? Hmmm … it strikes me as Southern, but not necessarily in a negative way. Though I can imagine some *might* view it in that light. (And in fairness, I’ve never lived in the American South. Perceptions almost certainly vary by region.) Let me ask this Q on social today and see what others say. The thing about Beaux is that it looks plural to me. (I mean, it is plural, in French.) And it’s pronounced with a ‘z’ sound at the end – more like Bose speakers than Bo. Except maybe, with Beau gaining in popularity and ‘x’ names so in favor, Beaux will be seen as an alternate spelling and people will get it? Not sure … going to ask about that, too! Beau is a good choice though (a “semi-favorite” of mine). I forgot to mention that apparently when I searched for Frederick that one wasn’t caught. Kelly, I did a search and didn’t catch it, either! I think I just need to rebuild my Boys’ Names/Girls’ Names pages over the next few weeks. […] of short forms – and back to Ben – how ’bout Beau for Benjamin?